Pictured, from left: Jessica Ludvigsen, SVP, Retail Banking, Axiom Bank; A. George Fuller, Treasurer, COMPACT; Rocky Robinson, Executive Director, COMPACT; Ron Strand-Sorrell, COO, Axiom Bank. 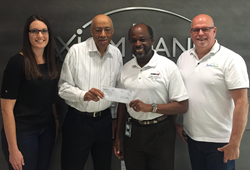 Axiom Bank, a federally chartered community bank, donated $500 to the Orlando/Orange County COMPACT Program on May 20, 2016. COMPACT, an Orange County Public School Program, is an education and business partnership that challenges students to succeed and reach their maximum potential. Axiom Bank’s cash donation was raised through the bank’s Dress‐Down Friday fundraising program, which asks bank employees to contribute $5 to charity in exchange for wearing jeans on Fridays. Axiom Bank’s contribution will help fund COMPACT’s broad-based effort to reduce the dropout rate and assist at-risk students. Since its inception in 1989, COMPACT has served more than 12,000 students, and is active at 16 Orange County schools. Axiom Bank, headquartered in Central Florida, is a federally chartered community bank that serves the financial needs of its customers through a wide range of financial products. Axiom Bank provides retail banking services, including checking, deposit, and money market accounts, through 20 branch locations, 19 of which are inside select Walmart Supercenters®. Axiom Bank also specializes in commercial loans for both real estate and business purposes, as well as treasury management and other merchant services. In addition to those services, Axiom Bank sponsors prepaid debit card programs offered by third‐party program managers. As part of the company’s commitment to exceed customers’ expectations and deliver superior financial solutions, Axiom Bank is constantly working to expand the services and products they provide to the communities they serve. For more information, visit: http://www.axiombanking.com. Member FDIC. Equal Housing Lender.